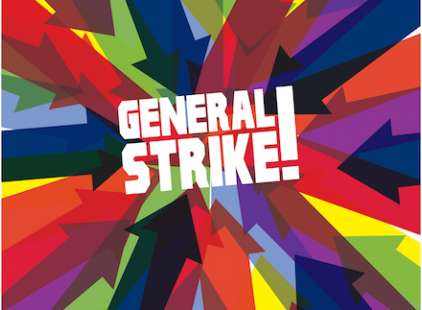 First, let’s get this clear: the TUC is not going to call a general strike of any kind. Aside from being tied into the electoral fortunes of Labour and the moderation of class struggle as social partners with the bosses, the only reason that they would ever call a strike is if they felt that they were being outflanked from below (which they aren’t as things stand) and then only as an exercise in letting off steam. This brings us to the second point, namely that the British labour movement is currently at no risk of breaking out of the control of the union bureaucracy. This means that there’s little for the union tops to fear from us and less for the government and the bosses to fear from us. There have been some marvellous exceptions to this, namely the IWGB, IWW and the Pop Up Union, but they are just that, exceptions. The business unions of the TUC are desperately committed to having a seat at the table in the management of capitalism, even now that they have stifled rank-and-file initiative so far that the bosses have no need to treat with them. Occasionally there will be a spark of a fightback, because they still have to sell themselves to their membership and because they do provide a service that we pay for when it comes to things like employment tribunals. But in terms of the broader class struggle, far from leading the way as they always claim they are little more than paper tigers. The answer to this isn’t to get “better” or more “left wing” leaderships in place. Left-led unions are just as abysmal as right-led ones, such as PCS treating the fight over pay, pensions and conditions as “interval training” and following brief flurries of activity with prolongued breaks in action. No, the answer is to build a rank-and-file that is strong, militant and active regardless of - even in spite of - the union leadership. This is slow, difficult and patient work. It involves lots of individual conversations and winning political arguments on a one-to-one basis alongside meetings, leafleting and other such activity. In some places, it may involve the risk of a backlash or repression not only from bosses but from unions. But it has to be done. Through this activity we give workers confidence. Not in their leaders, but in themselves. For the liberation of the working class is the task of the working class alone, and it is only by acting for ourselves that we can take the kind of action that can defy, then destroy, the anti-strike laws. The kind of action that will terrify the bosses and force concessions. The kind of action that can grow, organically and in an uneven wave, towards an all-out general strike. Leftists argue against this and in favour of the top-down 24 hour general strike because they claim that the working class aren’t ready yet to challenge the power of the capitalist state. But they - we - never will be if coddled and patronised like children. We will only be ready if we gain confidence in ourselves and fight for ourselves. If there’s one thing I want to see in 2014, it’s the spark of that beginning to grow. Forget your broad lefts and electoral games. Let’s put some real effort in on the ground and build the real movement that can sweep away the present conditions. It’s slow and it’s hard, but it’s also necessary. Let’s put some real effort in on the ground and build the real movement that can sweep away the present conditions. Agree with this. I wrote something similar early last year from an Irish perspective. I am a text researcher working on Gale's forthcoming textbook ISSUES THAT CONCERN YOU: SOCIAL PROTEST and my editors would love to reprint your article titled "IN SUPPORT OF DIRECT ACTION" from your propertyistheft.wordpress.com blog. Could you please let me know if an email address to which I can send more information and a permission letter? Or you can email me at kiran.kaur(at)qbslearning.com .